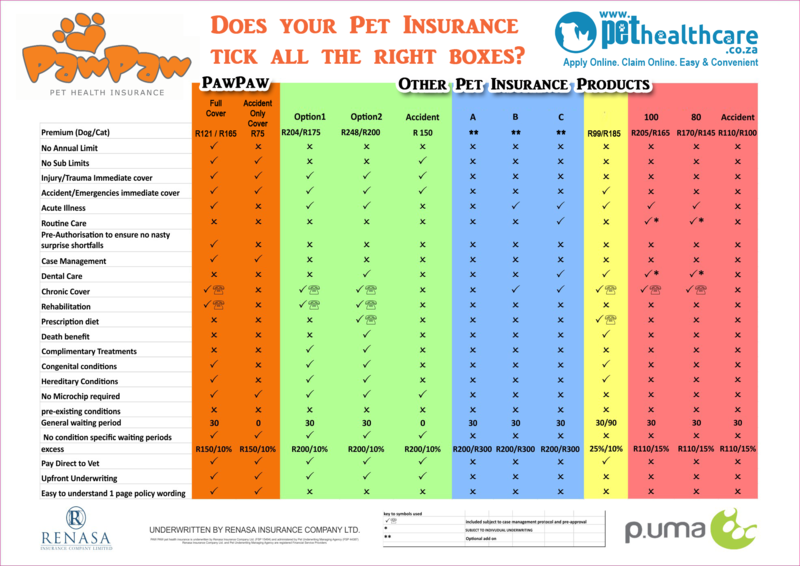 PawPaw is an insurance product designed to cover the unexpected veterinary costs that pet cats or dogs may incur as the result of illness or injury. PawPaw is underwritten by RENASA INSURANCE COMPANY LTD. and administered by PET UNDERWRITING MANAGING AGENCY PTY LTD (P.UMA). In return for paying your premium, RENASA INSURANCE COMPANY LTD. will cover the pet cat or dog named in the overleaf policy schedule for the cost of fees incurred as the result of veterinary treatments for illness and injury. Any pet cat or dog older than 8 weeks and younger than 8 years that is kept as a household pet in the RSA. All vaccinations must be up to date at the time of joining. All non-emergency treatments must be pre-authorised by P.Uma. You agree to disclose all information relating to your pets health and condition at the time of signing up for cover and thereafter. Failure to do so could result in cancellation of your policy due to-non disclosure. You must notify P.Uma of any emergency treatments within 72 hours of the event. All claims must be submitted to P.Uma within 60 days of the date of treatment. P.UMA reserves the right to refuse payment for repeated treatments if they are, under advice, deemed as ineffective or likely to cause the cat/dog undue distress. As the person responsible for the cat/dog you are expected to take all reasonable steps to prevent injury and illness. Failure to do so may result in rejection of claims and/or the cancellation of this policy. This policy may be terminated upon giving a one month written notice of cancellation and the cancellation shall be effective from the first day of the calendar month following the notice.